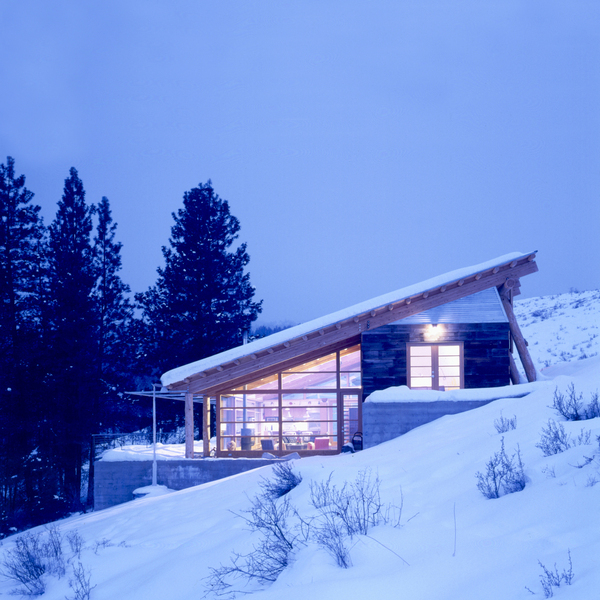 A 1,400 square foot cabin located in the mountains of North-central Washington State. 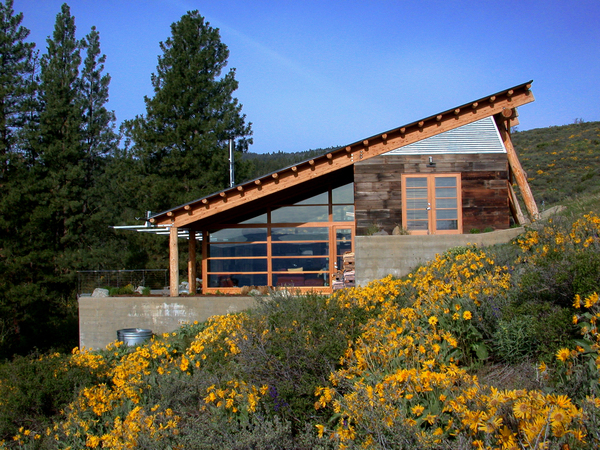 The cabin sits on a south facing slope with views to the south and east. 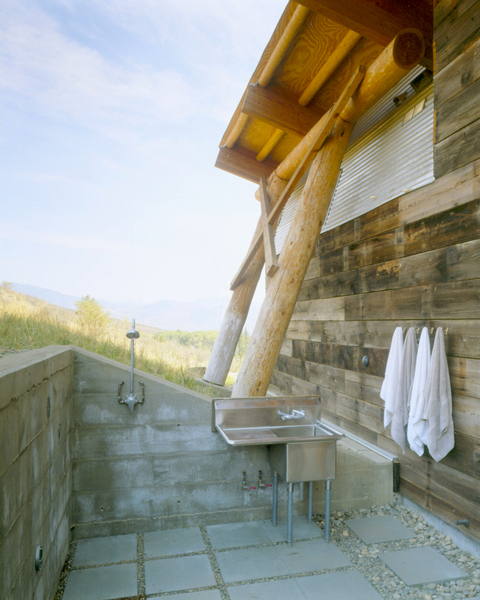 The materials selected for the cabin: logs, sawn beams, rough formed concrete and corrugated metal, are rough in nature to reflect the natural but untamed setting. 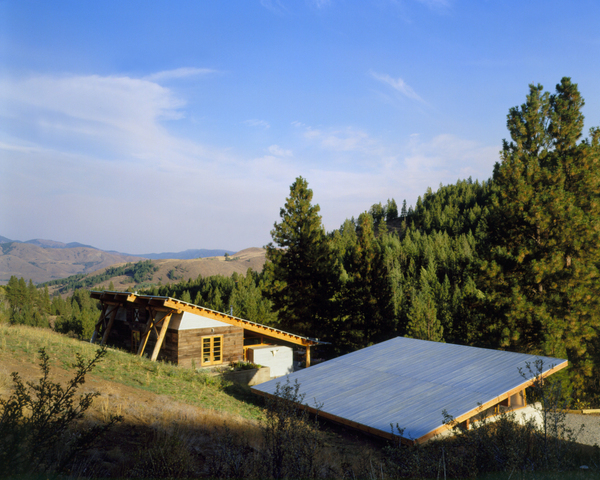 Two concrete walls form terraces on which the 2 level house sits. 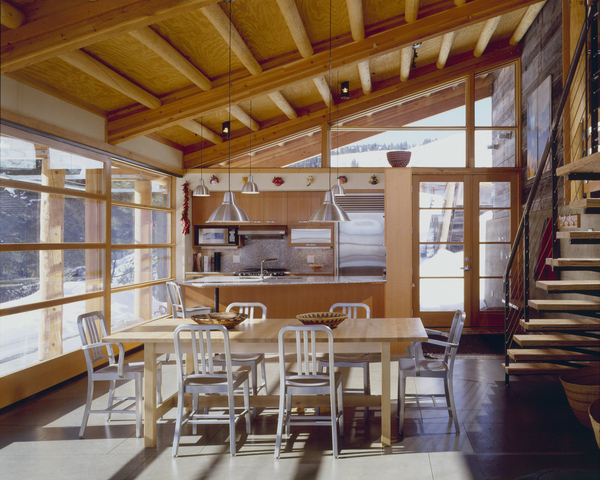 The lower terrace contains the living, dining and kitchen all as one large space. 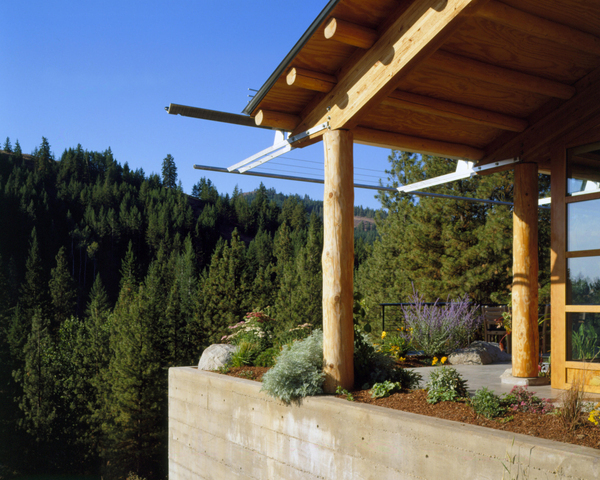 The upper concrete wall forms the back of the living area and creates a base for the upper terrace which contains 2 bedrooms and a bath. 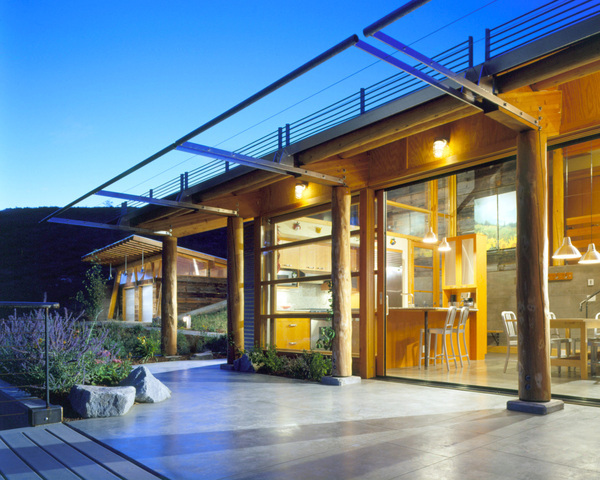 Two 8 foot by 8 foot sliding glass doors on the south side of the lower level opens the house to the outdoors. 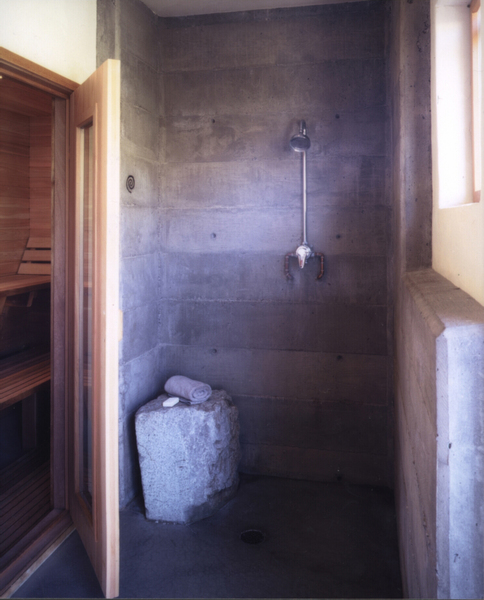 To further connect the house with the outside, all of the rooms have doors that open to the outside, including the bath, which opens to an outdoor bath for use in the summer months. 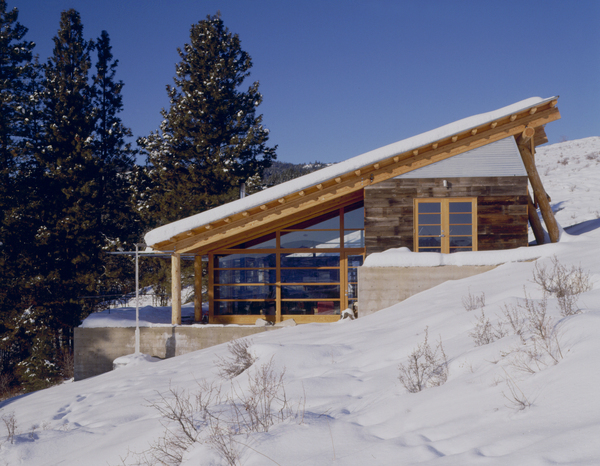 The house is designed to take advantage of passive solar heating. 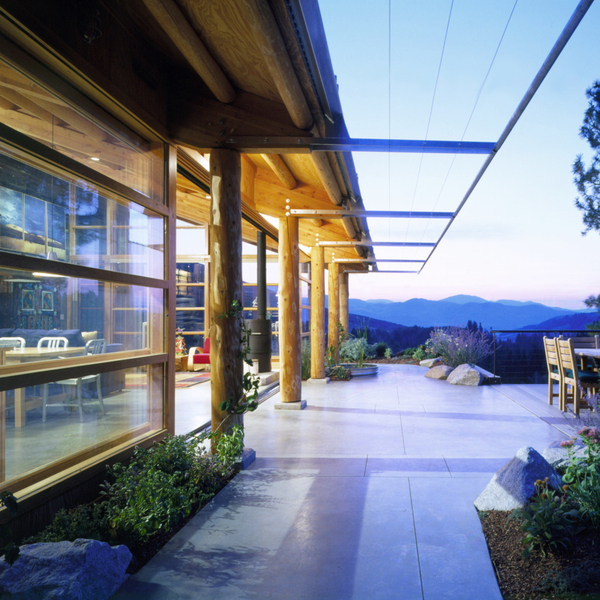 The majority of the high performance glazing faces either south or east. 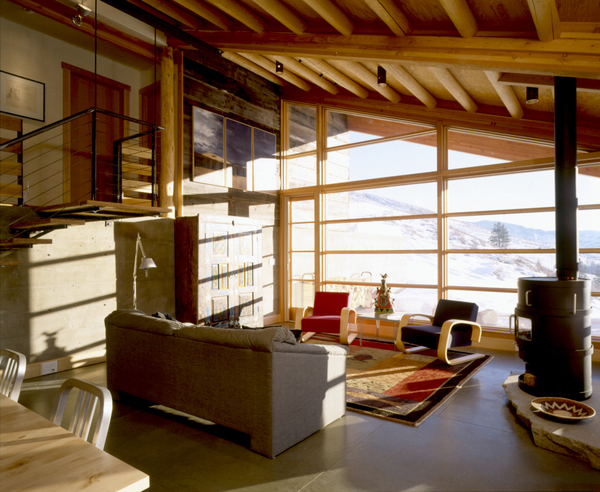 The east facing glazing was provided to allow for morning warming; even in summer, nighttime lows often reach the 30’s. 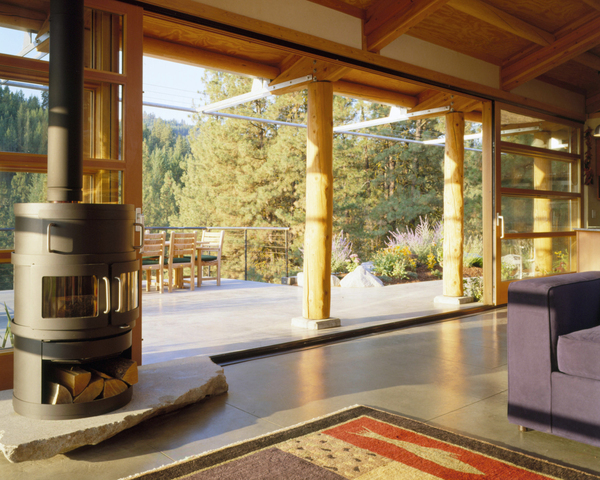 Thermal mass plays an important role in the reduction of diurnal temperature fluctuations both in the summer and the winter. 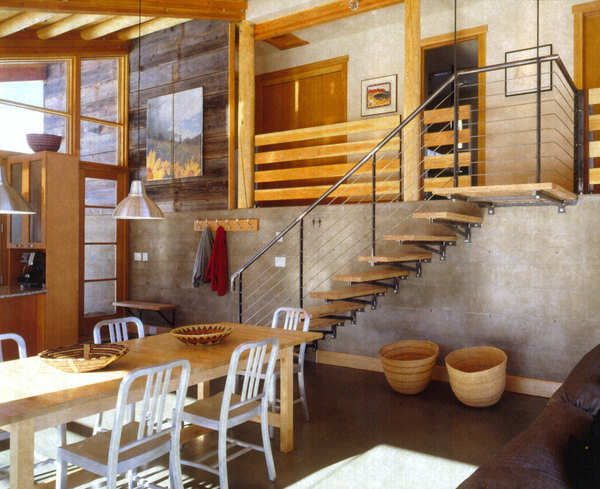 This includes an exposed concrete floor and a rough wood formed concrete wall that serves as a retaining wall between the upper and lower floors. The roof is insulated to R-50 and the walls to R-23. 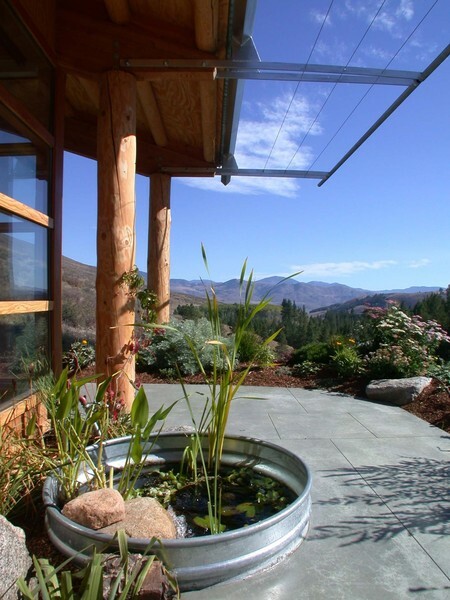 These factors combine to reduce energy use significantly below code requirements even with a large amount of glass. 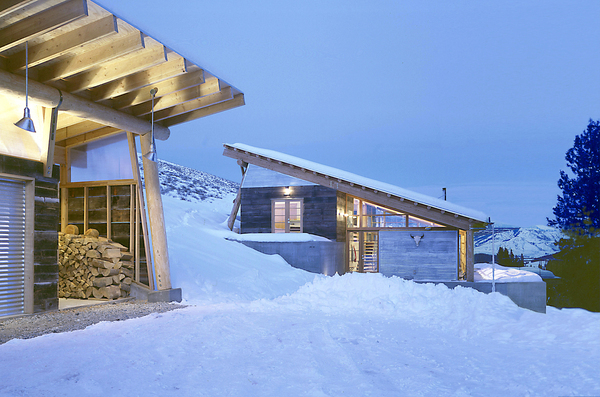 Significant attention was given to material selection for the house. 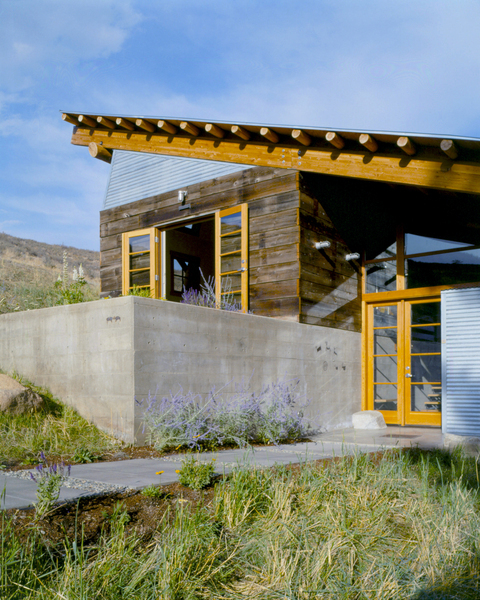 The house siding is wood that was salvaged from a water irrigation ditch. The 2x12’s have naturally weathered over the last 60 years. They were cleaned and sealed when they were installed. Hopefully, they will go another 60 years without much maintenance. 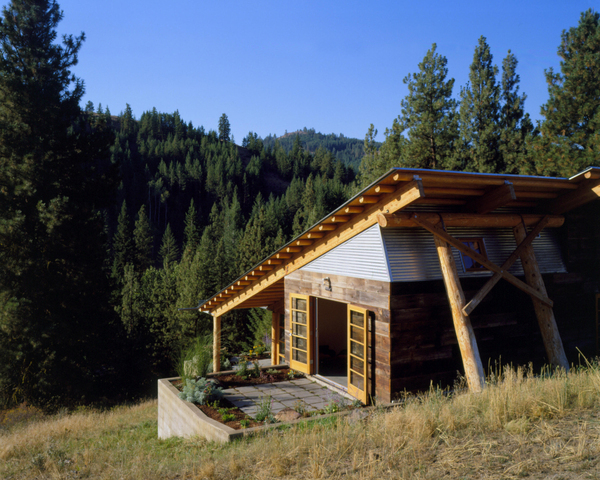 In addition, the roof purlins are Lodge Pole Pine logs that are salvaged from forest thinning. 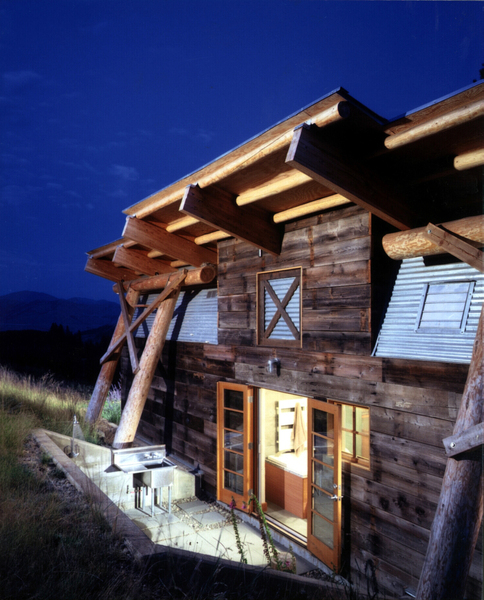 Much of the rest of the wood in the structure is “processed’ wood which is less of a drain on forest resources, including: glue-lam beams, rough sawn plywood used for ceiling and wall finish, exposed paralams for stair treads, I joists and paralams used for structure. Hand selected framing lumber was used to frame the critically important fixed portions of the window walls. 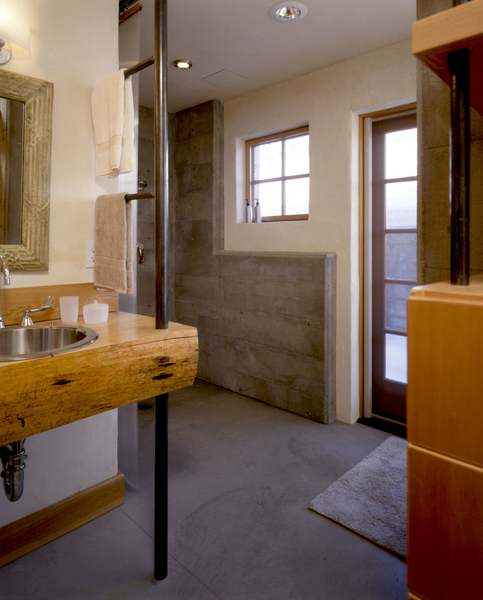 Additionally the cabinets and doors were constructed with veneered woods, a more sustainable approach that solid wood. 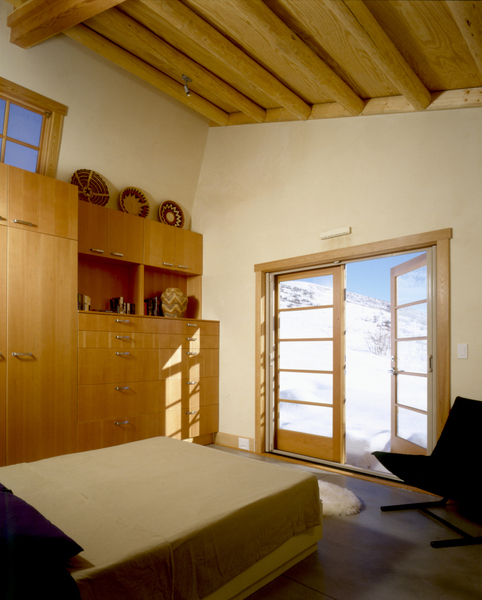 The use of interior plaster walls with integral color virtually eliminated the need for interior paint and are much more durable than gypsum board walls. 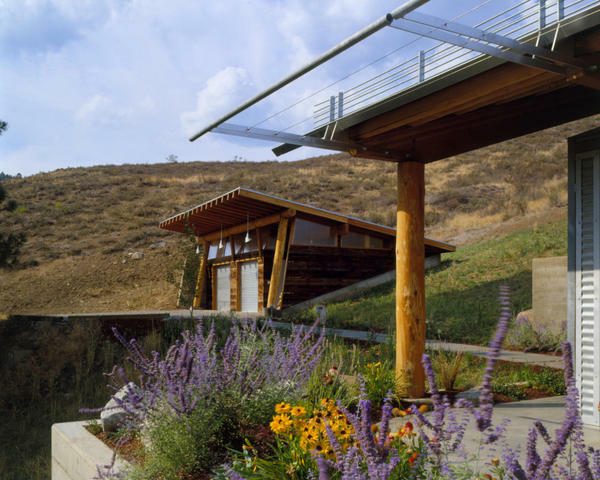 Wood Design and Building Magazine, Spring 2007 - Number 38, "Canyon House: Natural mountain beauty drives a design that blurs the distinction between indoor and outdoor." 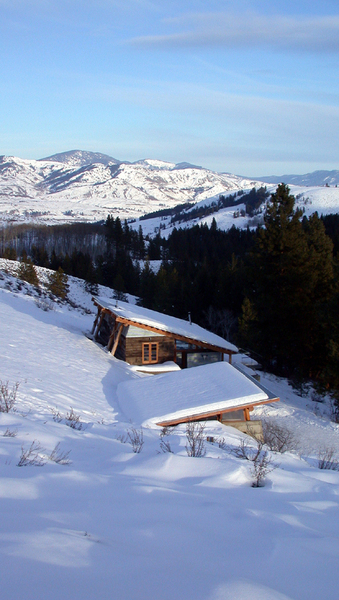 Sunset Magazine, December 2006 "Winter Retreat: Incorporating rugged materials and smart details, a Washington cabin disappears into its snowy setting." 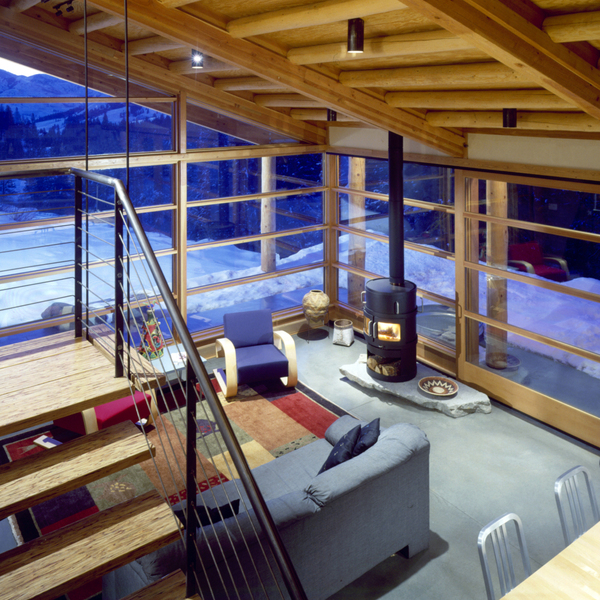 Custom Home Magazine, March 2006, "Outward Bound"
Residential Architect Magazine, March 2006, "k + b studio - bath: inside out"
Custom Home Magazine, Spring 2006, "Mountain Hideaway: A working vacation isn't so bad in an office like this"
Fine Homebuilding Magazine's Getaway Homes, Winter Spring 2006, "Communing with Nature"
Custom Home Magazine, March 2004, "Mountain Hideaway"
Trends Magazine, November 2003, "Open To The Stars"
Wood Design and Building, Winter 2003, "Cabin At Elbow Coulee"
Sunset, July 2002, p. 96, "Cabin Ingenuity"